My kids tried French toast at a school event and got too excited about it. So, they made a special request for it. 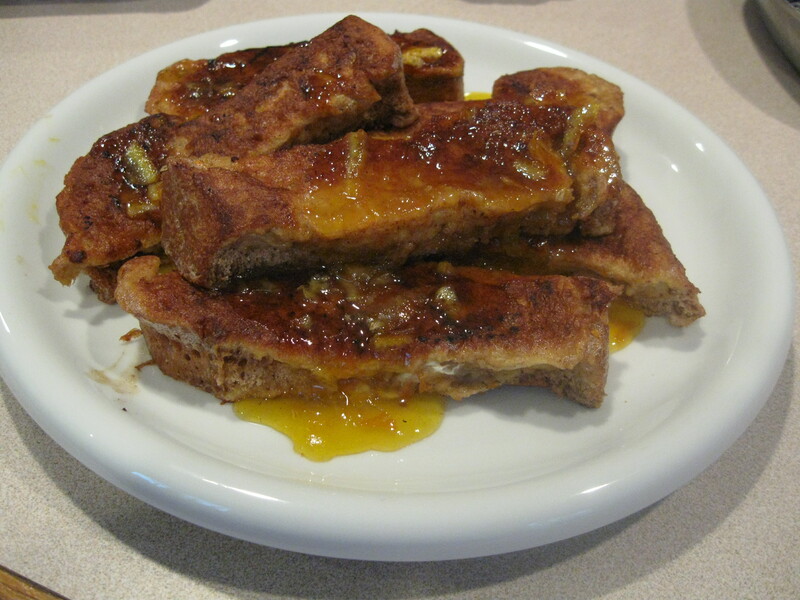 I always thought that French toast was just a fancy name for the poor man’s dessert my mom used to make when all we had at home was bread, eggs and sugar. I wanted to try something a tad more sophisticated. Nigella’s book was still lying on the table and, sure enough, she had a recipe for French toast. I tried it and, indeed, I found the taste to be quite sophisticated in its simplicity (despite the whole wheat bread, which is almost the only kind we eat at home). My kids wanted extra `sugar’ to please their palate and added extra marmalade but I was happy without anything extra on top, except, of course, for the little syrup that comes with the recipe. How to make: Dip the bread slices (or sticks) in the eggs and milk mix for five minutes. Then, turn the slices on the other side and let them soak for another 5 minutes. Heat the butter and cook the slices until brown. Flip over and cook until the other side is brown. In a small sauce pan, mix the juice with the jam and cook at low heat until the liquid acquires syrup consistency. Pour on top of the French toast. The french toast taste’s SO good.